These insects are very cunning and devious - both in their physical appearance and in their behaviour. Most species of cuckoo bee are disguised to look like wasps, with black and yellow markings on their abdomens and a thin 'waist' between the abdomen and the thorax. 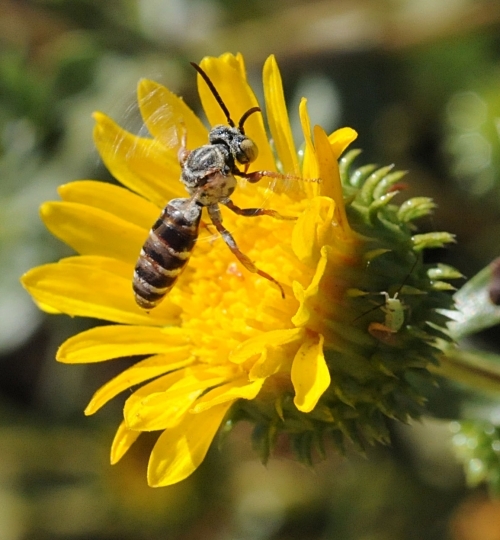 But cuckoo bees are particularly sly and clever in that they never bother to build a nest of their own - instead they just fly into an exisiting nest built by other bees and lay their eggs in there! They are able to gatecrash their way into other bee's nests because they have tough, protective coats and increased stinging power. When the cuckoo bee's larvae emerge from the eggs they kill the larvae of the rightful owners of the nest and eat all the food that was intended for them! Cheeky! would be what you always heard. to announce the time so proudly. some nectar is what you'd give 'em. to wake you from your slumber. to tell the time instead!